For Tami Reiss, the inspiration for Just Not Sorry—the new app she created that aims to stop women from resorting to undermining phrases in emails—was all over her inbox. When installed as a Chrome extension, the app underlines words like “just,” “sorry,” “I think,” and “does this make sense” in shame-y crimson red digital ink. Already, thousands have downloaded the plug-in. “It came to me from a variety of places,” Reiss says. “One, I like to build things that actually help people. Two, years ago, I did this influencer training and part of what we learned there was about what they called structural influence…which is that you can create an environment that supports positive change. It’s like, ‘Don’t put a stumbling block in front of a blind person,’ but the opposite. How do you create an environment that helps people know what they should be doing? How do you make it easy for them to make good choices?” Reiss looked around at the data and the op-eds and the shampoo ads and that Amy Schumer skit and at a million more meditations on how and why women say they’re sorry. And she decided to do something about it. I’m sorry to do this to you but this is yet another piece on “Just Not Sorry” because I just don’t quite get it, apologies. I know you’re busy, so I’ll keep it brief. Here is my problem: when did being polite become a bad thing? Trump’s tweet went thus: “Despite the constant negative press covfefe”, and that was it. Keyboard detectives have pointed out that the strokes needed to type “erage” are vaguely similar to “fefe”, and that would fit semantically with the rest of the brainfart. So, boringly enough, he meant to type “coverage”. But it was too late. Covfefe was born. And with it, the new discipline of Covfefe studies. The oldest written language in the world didn’t have an alphabet. When written language began, it wasn’t used to ‘sound out’ words the way many writing systems do today; instead, each symbol represented a word (or occasionally part of a word). If that sounds familiar to you, it’s probably because speaking with pictures is a familiar concept — modern Chinese (hanzi) is a kind of logographic writing system, as is Japanese kanji. Younger readers, of course, may jump to an even more modern example of a logographic writing system — stickers. There has been a lot of ink spilled about how stickers and emoji are bringing about the death of modern communication, but that draws an incorrect (and Western-biased, and frankly kind of racist) parallel: that language evolved from a logographic language (hieroglyphics, say) into an alphabetic language (English). In point of fact, English didn’t evolve from a logographic system at all; it’s a cousin, not a child. And Mandarin, whose billion active speakers make it the single most spoken language in the world, uses a syllable-based logographic language system. Now, linguists may object to the classification of emoji as a logographic writing system. Two elementary school students in California have proven that friendship can go beyond any language barrier. One day at school, Amanda Moore noticed a classmate, Rafael Anaya, eating lunch alone. When she spoke to him, she noticed he didn’t speak much English. That’s when she decided she’d simply communicate with a note instead. According to CBS News, Amanda used Google Translate to write a letter in Spanish to Rafael and asked her mom, Kimber Kinard, to proofread it. The heaviest users of Facebook believe that other people are happier. News feeds contain numerous “envy-inducing incidents,” and the more you skim, the more you compare yourself to others, leading to “invidious emotions.” Looking at your friends’ babies and vegetables might seem like a good idea at the time, but all those Anne Geddes shots will probably just make you sad. But “sad” isn’t nearly a nuanced enough word for the confusing concoction of emotions at play. It’s sadness borne of envy—because your friend has what you want. Even acknowledging such envy can make you sadder, because you realize that underneath the jealousy, you really are genuinely happy for your friend. And there’s self-disappointment in the mix: You should be able to rise above your own jealousy, right? Aren’t you a good friend? …This word doesn’t appear to exist in the English language, and a quick survey of world languages didn’t uncover it. The feeling turns “schadenfreude” on its head: Instead of happiness over others’ misfortune, it is closer to sadness over others’ success. I’m not a fan of clumsily flipping “schadenfreude” around and calling it freudenschade—although many have had this idea before. Perhaps if we made it freundenschade, layering in the German word for “friend”? Like humans, Apple’s virtual assistant can sometimes stumble over names that don’t read the same way they sound when spoken aloud. But as with humans, you can tell Siri the proper pronunciation of the name for future reference. 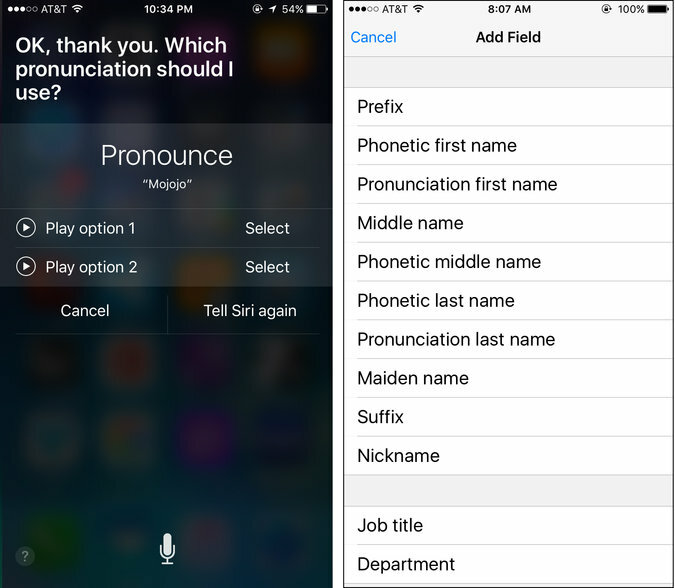 The next time Siri mangles a name, tap the microphone button and say, “That’s not how you pronounce [Name].” The program should respond with, “O.K., how do you pronounce the name [Name]?” Say the correct pronunciation of your first and last name as clearly as you can. Siri will then fire back with, “O.K., thank you. Which pronunciation should I use?” and offer a few variations of your first name to play back. After you have listened to the choices, tap Select next to the one you want and then move on to Siri’s attempts to pronounce your last name. Check out examples on this site, and then check out OgilvyDo for this article about Siri’s problems with understanding spoken accents.